Loker123.com - Lowongan Kerja Bandung Branch Account Officer PT Bank Resona Perdania. Bank Perdania was established in 1958 as a commitment to support the realization of better economic cooperation between Japan and Indonesia. The journey taken by Bank Perdania to achieve business maturity was accomplished through various initiatives, and this culminated in our success in establishing two branch offices in Surabaya and Bandung. The branch offices brought momentum for Bank Perdania in thriving to expand presence through banking industry in this country. The continuous experience and learning process had driven Bank Perdania forward, followed by the changing of names to Daiwa Perdania Bank in 1994, Bank Daiwa Perdania in 1999, and Bank Resona Perdania (“the Bank”) in 2003. Supplied with extensive history of contribution in strengthening international business cooperation between Japan and Indonesia, the Bank have served and supported the national economic development for more than 55 years. 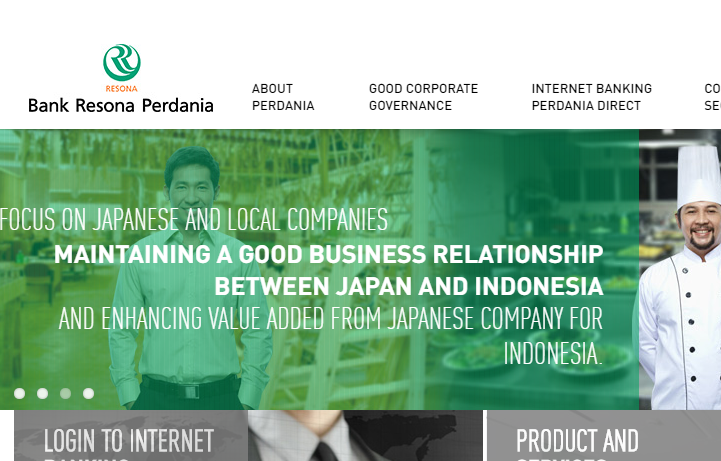 The Bank primarily focuses on Japanese companies, Japan-Indonesia joint venture companies, and local companies. The Bank provides services including various types of corporate banking products and services such as deposit, credit, export, import, remittance, bank guarantee, as well as leasing service through the subsidiary of PT Resona Indonesia Finance. Deep analysis of financial statements, especially related to corporate and / or loans within the scope in the field of manufacturing, business services (consulting services, accounting firms, lawyers, etc. ), project finance, construction and property, financial institutions and insurance. Reaching the target of credit growth, creating strategy of the managed loan portfolio, non-performing loan and other business in accordance with the targets that has been determined by Bank. Sarjana atau Diploma III dari universitas terkemuka jurusan Marketing, Perbankan, Keuangan, Ekonomi, Hukum, Teknik, dsb. dengan IPK 3.00. Memiliki pengalaman sebagai Account Officer di wilayah pemasaran di Corporate Banking dan / atau Lending selama lebih dari 3 tahun. Memiliki pemahaman yang baik dalam menganalisis laporan keuangan, mengerti tentang hukum perbankan dan memiliki kemampuan negosiasi yang baik. Memiliki kemampuan untuk berkomunikasi dalam bahasa Jepang dan/atau Mandarin lebih disukai. Memiliki penampilan, komunikasi, keterampilan interpersonal yang baik dan sangat termotivasi. Memiliki kemampuan komputer yang baik (min. MS Office). Mampu bekerja dalam tim, di bawah tekanan dengan deadline laporan yang ketat.